Welcome to Splendid Stitches, London’s only dedicated specialist vintage clothes alterations and repairs service, with a specific focus on clothes from the 1920’s to 1970’s, along with vintage reproduction. Our specific focus on vintage means we have unrivalled experience in dealing with the often tricky and unusual alterations and repairs required for clothes several decades old, and our expertise spans classic alterations such as re-sizings and shortening hems over repairs such as changing broken zips, fixing rips and patches, to replacing old linings, or refashioning something new out of something old, for example turning a dress into a skirt and top. We also offer extensive vintage wedding dress alterations and repairs, and after-the-wedding wedding dress restoration. 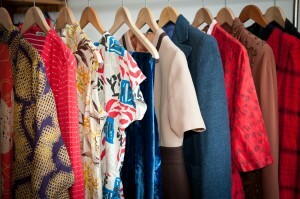 We can also recommend drycleaners, and furriers who can carry out the restoration of vintage furs. Please see the ‘services’ section for details of those. We pride ourselves on excellent workmanship and a personal service which is specifically tailored to each particular project, whether restoring a delicate 1930s silk gown, resizing a WWII wool suit, or replacing zips in 1960s mod dresses. Splendid Stitches is conveniently located for London public transport in Hastings Street in Bloomsbury, moments from Kings Cross St. Pancras stations. We have the privilege of working out of Atelier Tammam’s beautiful and luxurious studio, which allows for a relaxed environment for consultations and fittings. We operate strictly BY APPOINTMENT ONLY to allow sufficient time and privacy for a personal fitting and mutual assessment of the best options for the individual garment: please use the contact form in the ‘Contact Us‘ section to ask us any questions about your garment if you want to know more before booking an appointment. Appointments can be booked via our online booking system or by sending us an email or calling the studio. We also offer repairs to UK based clients via post. Please email us for further details. Why Use A Vintage Specialist? 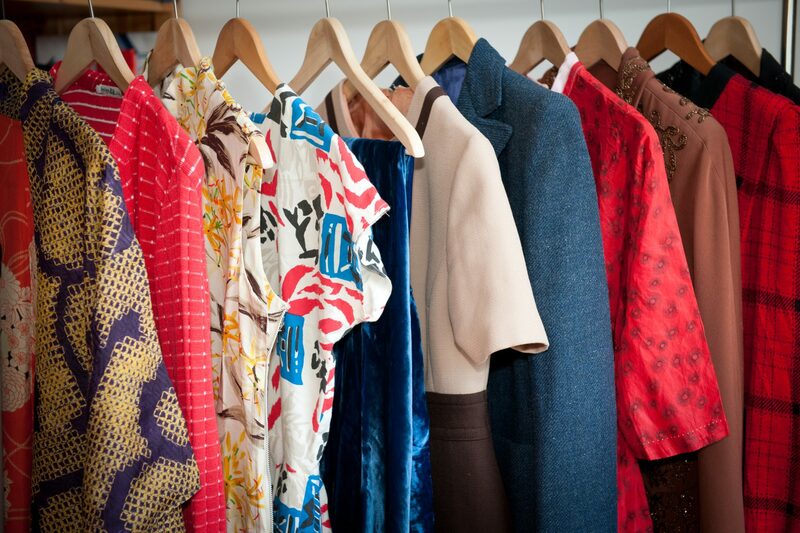 As we only deal with vintage, we know and understand that each item is unique and possibly rather delicate, and we treat each garment with utmost care and respect – as vintage clothes lovers ourselves, we know how important each individual piece of clothing is. Clothes construction, finishes and fabrics have changed immensely over the years, and is very different to modern, mass-produced clothing. Especially pre-1970s clothes were often made-to-measure, or at least made to be altered to fit. It therefore makes sense to use someone with experience of the construction methods and fabrics used in vintage, and – most importantly – someone who understands how your garment may have changed over time. About half of the items we see have been altered in the past, which will need careful undoing or redoing. 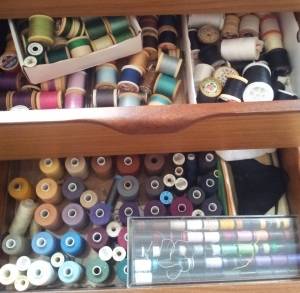 We stock original vintage haberdashery including deadstock zips, buttons, threads and trimmings, and will use these for further authenticity if suitable. We also understand the changing vintage silhouettes from 1920s flappers over 1940s landgirls, to 1960s mods and beyond, and the terminology associated with vintage, so if you are trying to achieve a certain look, from steampunk to rockabilly and beyond, explaining that is simple and easy. Splendid Stitches is the brainchild of Nanna Sandom, a lifelong lover and wearer of vintage who learned to sew and alter clothes in her native Denmark. Having run Splendid Stitches for nearly a decade, she estimates she has personally altered or repaired over 3000 vintage garments in this time. 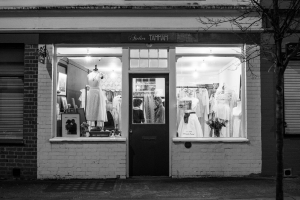 Splendid Stitches works with a number of prestigious London vintage boutiques and have loyal clients all over the UK spanning clothes collectors, celebrities and families wanting to restore their heirlooms. Nanna champions vintage as the ultimate sustainable choice when it comes to clothing and is driven by strong ethical and body-positive views. She often shares her knowledge of vintage clothes and offers tips and advice on Instagram, Twitter and Facebook so please join us there, or sign up to our monthly newsletter.